Oregon Black Mouth Cur Rescue View other Black Mouth Curs for adoption. 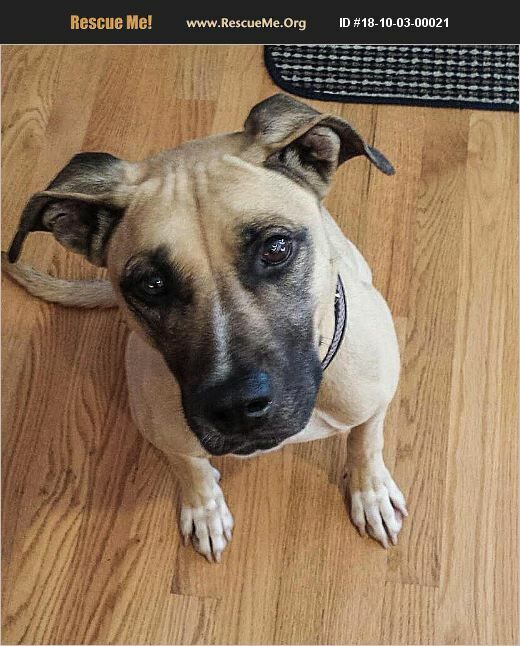 Maggie is a spayed female yellow Black Mouth Cur,FOSTERED in CORVALIS OREGON OWNER SURRENDER: their INFO BELOW: approximately 4-5 years old, 47 pounds, who is up-to-date on all her vaccinations, tested negative for heartworm in April 2018, and is not currently on a heartworm preventative medication. She eats Taste of the Wild High Prairie dog food, fed twice daily, is housebroken and micro-chipped. She sleeps in her plastic crate at night. HISTORY: We adopted this beautiful girl as a homeless stray from Houston, TX where she was picked up and scheduled to be euthanized. We received her June 1, 2018 and intended this to be her forever home. We quickly learned she has some resource guarding issues with other dogs (food, treats, toys, her kennel, her persons) and a strong prey drive which resulted in her biting our small poodle mix rescue a couple of times. She gets along better with our large dog, after they had a meeting of the minds. We have come to realize that our home is not the best fit for Maggie due to the presence of our small dog. We love her dearly, but can't risk the little guy's safety. GOOD : Maggie learns quickly, and now waits at the door before going out, and waits at the wire crate prior to loading in the car. She loves to go along, whether walking, hiking or riding in the car. She loves to run and her nose is always on the ground tracking scent! She can now walk on leash, sit, stay, down, up, off, shake, and is improving daily on recall. Her attention span is improving, we have worked on her impulse control and try to keep her level of excitement low through redirection of her attention. She is food motivated and works nicely for treats. She longs for human affection and love, and was super with our grandchildren (12+ years old). She loves to lay next to you and have body contact. This sweet and special girl will make the right owner a wonderful pet. BAD : Maggie has resource guarding issues, and is possessive of her food, toys, bed, and persons. If a human is in charge of the treats, then she waits nicely for her turn. But if there is no human around, she can show aggression to other dogs. Maggie has had a difficult life, and has some broken teeth. We had her teeth cleaned and there is no nerve damage to the broken teeth at this time, but that is something that will need to be monitored over the course of her life. She also was mostly likely spayed at a very early age, and so has some urine dribbling issues. She is on Incurin medication and that has cleared the problem up. She will likely need to remain on that medication. Maggie does well with other dogs at the park (on leash) as long as they do not posture against her. If they posture towards her, she hackles up and postures back. She didn't like a man just walking straight up towards her, but seems okay with women and children walking close to her. UGLY : Maggie has bitten both our other dogs due to resource guarding. Our big dog held his ground and bit her back, since then she has respected him and not gone after him, evening lying beside him and licking his ears occasionally. He is a neutered male, with a mellow temperament. Our other dog, the poodle mix, is the one she bit most recently when the treat drawer was opened and the little guy came running happily into the room right up next to her. He is small, yappy, with high energy and that doesn't set well with her at times. RESCUE ADMIN INPUT: Maggie hasn't been with them long enough for shelter stress and trauma to be gone. Many large dogs do not get along with small dogs. She is still sorting all this new family/pack out. She has learned a lot. We have more videos of her and she really has the makings of a good dog in time and with patience. If she tugs at your heart and you can give her time and love we will support and help, please contact us and fill out an adopt application. No one is obligated by filling out an app but it is our first requirement to get acquainted. Go to our website www.jcldr.com fill out our on line app and we will then visit by phone to see if she might be a fit.